Voters in Natchitoches Parish School District 9, which includes the city schools, will vote Saturday on whether to fund improvements to those schools. Those schools include Weaver Elementary, East Natchitoches Elementary, Frankie Ray Jackson Technical Center, Natchitoches Magnet School, NSU E-Lab and NSU Middle Lab, L.P. Vaughn Elementary, Natchitoches Jr. High and Natchitoches Central High School. There are some 4,300 students in those schools. 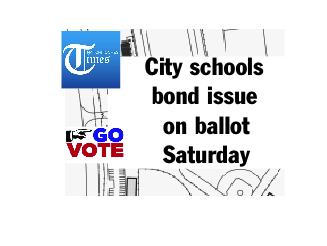 There will be one proposition on the ballot Saturday, whether to approve a $19.7 million 20-year bond issue. The bond issue will focus on the following: •Major facility and building stems upgrades at District 9 campuses •Enhancement of campus security fencing and systems •Energy and maintenance savings •Repairs and modernization •Renovations and additions to the Natchitoches Jr. High and Natchitoches Central •Mechanical, electrical and communication upgrades that are at least 20 years old •Outdoor activity space •Inadequate bathrooms, old gym bleachers, worn out parking lot and track and concession facility at Natchitoches Jr. High •Additional classroom space at Natchitoches Central High school where the school has outgrown the field house. There is no grandstand nor restroom/concessions facility at the football field. Homestead exemption will apply to the proposal. For example, for a home valued at $100,000 would cost the property owner $20 per year. A home valued at $300,000 would cost the property owner $180 per year. “It’s all for the children,” Supt. of Schools Dale Skinner said.